Researchers have reported the creation of pseudo-magnetic fields far stronger than the strongest magnetic fields ever sustained in a laboratory – just by putting the right kind of strain onto a patch of graphene (a sheet made from a single layer of carbon atoms). The finding, reported in Science, adds to graphene’s growing list of experimental surprises. Previously, it was difficult to sustain tremendously strong magnetic fields in a laboratory setting. The current record is 85 tesla for a field that lasts only thousandths of a second. When stronger fields are created, the magnets blow themselves apart. The ability to make electrons behave as if they were in magnetic fields of 300 tesla or more – just by stretching graphene – offers a new window on fundamental science made possible by graphene’s electronic behavior, which is unlike any other material’s. Crommie explained that a carbon atom has four valence electrons; in graphene, three electrons bond in a plane with their neighbors to form a strong hexagonal pattern, like chicken-wire. The fourth electron sticks up out of the plane and is free to hop from one atom to the next. These electrons (known as pi-bond electrons) act as if they have no mass at all and can move at almost one percent of the speed of light. The idea that a deformation of graphene might lead to the appearance of a pseudo-magnetic field first arose even before graphene sheets had been isolated, in the context of carbon nanotubes (which are simply rolled-up graphene). In early 2010, theorist Francisco Guinea of the Institute of Materials Science of Madrid developed these ideas and predicted that if graphene could be stretched along its three main crystallographic directions, it would effectively act as though it were placed in a uniform magnetic field. This is because strain changes the bond lengths between atoms and affects the way electrons move between them. The pseudo-magnetic field would reveal itself through its effects on electron orbits. Describing the discovery, Crommie says, “We had the benefit of a remarkable stroke of serendipity.” Crommie’s research group had been using a scanning tunneling microscope to study graphene monolayers grown on a platinum substrate. A scanning tunneling microscope works by using a sharp needle probe that skims along the surface of a material to measure minute changes in electrical current, revealing the density of electron states at each point in the scan while building an image of the surface. Sure enough, close examination of the triangular bubbles revealed that their chicken-wire lattice had been stretched precisely along the three axes needed to induce the strain orientation that Guinea had predicted would give rise to pseudo-magnetic fields. The greater the curvature of the bubbles, the greater the strain, and the greater the strength of the pseudo-magnetic field. 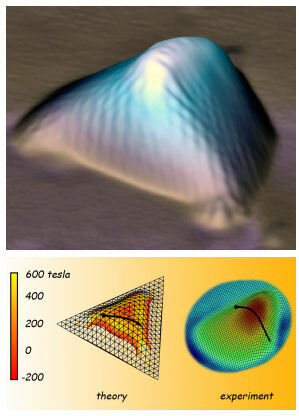 The increased density of electron states revealed by scanning tunneling spectroscopy corresponded to Landau levels, in some cases indicating giant pseudo-magnetic fields of 300 tesla or more. To get the highest resolution from the scanning tunneling microscope, the system was then cooled to a few degrees above absolute zero. Both the graphene and the platinum contracted – but the platinum shrank more, with the result that excess graphene pushed up into bubbles, measuring four to 10 nanometers across and from a third to more than two nanometers high. To confirm that the experimental observations were consistent with theoretical predictions, Castro Neto worked with Guinea to model a nanobubble typical of those found by the Crommie group. The resulting theoretical picture was a near-match to what the experimenters had observed: a strain-induced pseudo-magnetic field some 200 to 400 tesla strong in the regions of greatest strain, for nanobubbles of the correct size.